The resurgence of feminist thinking among young women in recent years makes this a timely moment to revisit the photographic activism of an earlier generation. In the 1970s, women artists who belonged to feminism’s ‘second wave’ used photography as a polemical and expressive tool to challenge patriarchy and sexism and show how women’s roles were constructed and maintained within a male-dominated society. ‘Feminist Avant-Garde of the 1970s’ at the Photographers’ Gallery in London, curated by Gabriele Schor, gathers more than 150 works from the Verbund Collection in Vienna, made by 48 artists. This is no dry history lesson and, four decades later, many of these pieces, which include videos and drawings, still seethe with frustration and fury. In Austrian artist Karen Mack’s ‘Demolition of an Illusion’ (1977), she cradles a jar of jam – a symbol of domesticity – tenderly against her cheek, like a model in an advert. 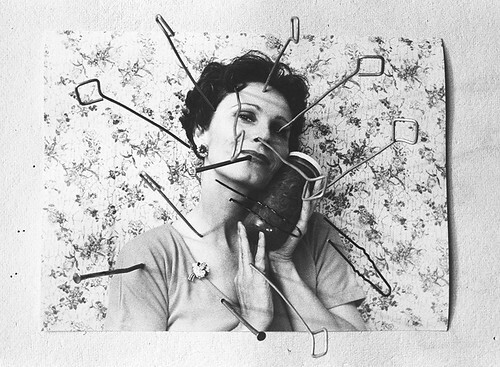 In the course of five more images, nails and pins pierce her face and body, and the photo, now seen for what it is, a representation bordered by a frame, is systematically torn to shreds until the image has gone and only a few bent pins remain. Karin Mack, Zerstörung einer Illusion, 1977. © Karin Mack / The Sammlung Verbund Collection, Vienna. 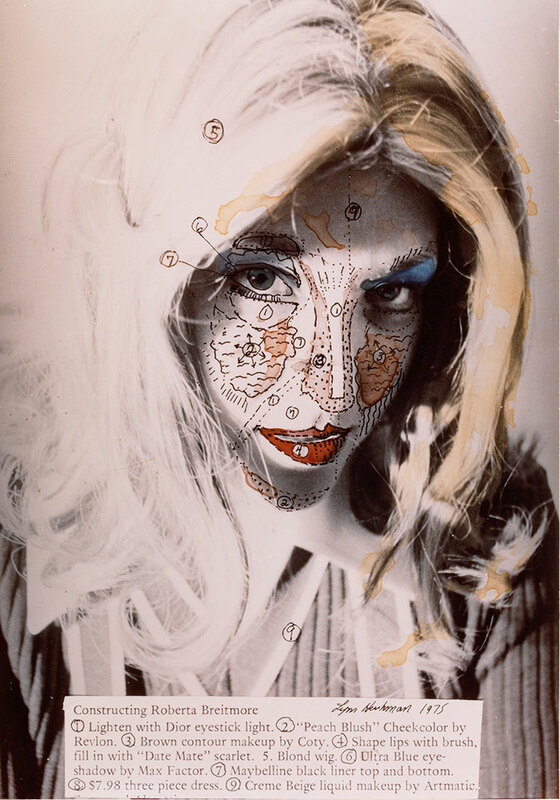 Top: Lynn Hershman Leeson, Roberta Construction Chart #1, 1975. © Lynn Hershman Leeson / The Sammlung Verbund Collection, Vienna. Feelings of confinement and the difficulty of thriving within an unequal and distorted society are recurrent themes and the artists often appear as both subject and performer. 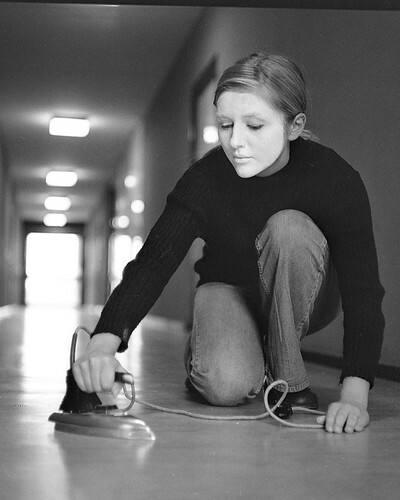 In ‘Isolation’ (1972), a series of eight pictures, West German artist Renate Eisenegger tapes cotton wool over her mouth, depriving herself of speech and sustenance. Frame by frame her individuality and each of her senses are obscured by bandaging and even her hands are immobilised within the mask, as though she has become entirely unable to function. In ‘Self’, Annegret Soltau imprisons her face within a web of black thread, while Ana Mendieta makes her facial features appear grotesque by squashing them against a pane of glass. Renate Eisenegger, Hochhaus (Nr.1), 1974. © Renate Eisenegger / Sammlung Verbund Collection, Vienna. Other series focus on the identities habitually assigned to women. Martha Wilson, an American, itemises these roles as goddess – the ‘fashion-model archetype’ to which many feel a pressure to aspire – housewife, working girl, professional, earth mother and lesbian, and dresses up accordingly, allowing herself a degree of latitude with studio lighting and props. With ‘The Invention of Femininity’, Marcella Campagnano from Italy styles herself even more convincingly in the garb of ten distinct social types, each shot in a tougher, more consistent and anthropological style. In Cindy Sherman’s ‘Bus Riders 1’, the implicit humour of these impersonations (which could be seen as patronising) comes to the fore as the doyenne of identity manipulation assumes the look, characteristic pose and personality of a gamut of characters, both female and male. Since the purpose of these projects is often analytical and didactic, it is only to be expected that the aesthetics of the photographic image is not the primary concern for these artists. The work is rarely a single picture. Many are shot in the controlled conditions of the studio with bare backgrounds behind the subject. This is brilliantly haunting in a series titled ‘(Cuckoo) from 4th Dimension’ (1978) by Margot Pilz, where a man looms over his wife, who is seated, as if trapped, on an angular chair. As the sequence unfolds, both figures dematerialise and the blurred and oppressive form of their son, one male replacing the other, finally deposes the woman, eradicating her identity. If more of the artists had been documentarists, though, there might have been more pictures like Helena Almeida’s outdoor shots of disembodied female hands reaching out through gates and railings, which stand out in this grouping and imply other visual directions. 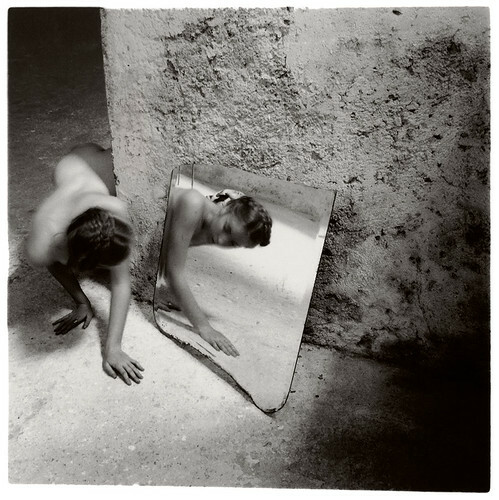 Francesca Woodman, Self-deceit #1, Rome, Italy, 1978 / 1979. © Courtesy George and Betty Woodman, New York / The Sammlung Verbund Collection, Vienna. The most remarkable maker of images in the exhibition is the precociously accomplished American photographer Francesca Woodman, whose work is touched by genius. The gallery recognises the oneiric and emotional charge of these structurally adventurous and always mysterious images by placing a huge blow-up of one of them on the wall in the staircase. Woodman hangs by her fingers from the doorframe in a Rome apartment, her bare feet swinging above the floor. She was perhaps nineteen and would take her own life four years later. She is more relentless in her self-focus and use of her body than any artist in the show and constantly seems to be able to uncover new facets of herself without assuming other guises. Yet her experiments as a performer entirely at ease in front of the camera feel highly intuitive and remain permanently open to interpretation, rather than arising from a programmatically feminist agenda. Woodman’s work has an enduring reverberation that I can’t find in Orlan’s self-satisfied ‘Occasional Striptease with Trousseau Sheets’, or Hannah Wilke’s ‘Super-T-Art’, where she assumes twenty different poses, combining a stylised striptease with Christian iconography. They both seem too knowing and ambiguous in motivation. For sheer nerve, Carolee Schneemann performed the most audacious and humorous disrobing in 1972, balanced on a dining car table in a train rattling along from London to Edinburgh. Schneemann turned this stunt into a photo-collage storyboard accompanied by excerpts from Wittgenstein’s Tractatus Logico-Philosophicus. This is a show packed with engrossing images and episodes from art’s social history.